Photographs by Horace Ove. A stunning new exhibition capturing the emergence of black politics and charting the rise of carnival in Britain over three decades from the 1960's onwards. "Horace Ové is undoubtedly a pioneer in Black British history and his work provides a perspective on the black experience in Britain." Living and working in London for three decades from the 1960's onwards, Trinidad born Horace Ové captured the emergence of black politics in Britain and this landmark exhibition presents the first in-depth look at his photographic back catalogue. Horace Ové is internationally known as one of the leading black independent filmmakers to emerge in Britain since the post-war period. What is not generally known is that since the 1960’s he has been photographing Britain’s black diaspora community. It is in this aspect where his work as a photographer is unique. 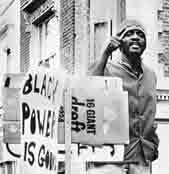 He was active during this period, working alongside artistic factions and political activists, but at the same time had the vision and artistic ability to document events, individuals and the gatherings of black peoples from Africa, Caribbean and the USA – the diaspora – amongst the home grown black communities. Here was an artist keen to explore his diasporian roots with works which made links with Europe, Africa, the USA and the Caribbean. The images are not journalistic or documentary in the Picture Post genre, but are time-based stills which utilise Ové’s skills as a filmmaker, painter and writer to construct images or key moments of the black diaspora in Britain. 1960's Britain was a hotbed of political and creative activity, writers and thinkers came from around the world to discuss civil rights issues and form new movements. Horace Ové was at many of the meetings and captured the events as they unfolded, including the first Black Power meeting with Stokely Carmichael, Allen Ginsberg and Michael X, founder of the black power movement in the UK with John Lennon and Yoko Ono. He also photographed figures of the period including C L R James, James Baldwin and Darcus Howe as well as Sam Selvon, Andrew Salkey and John La Rose the founding members of the Caribbean Artists’ Movement. Ové also recorded the birth of the Notting Hill Carnival and charted its growth through the 1970's and 1980's from the early beginnings with the first Windrush generation to the pumping sound systems, fashions and street dancing of the younger generation. He has also recently brought his work up to date with new portraits of people like Sir Trevor MacDonald and Professor Stuart Hall. This new exhibition provides an incredible insight into an explosive and culturally exciting period of British history. This exhibition is co-curated by Jim Waters and David A. Bailey, and in association with Autograph - ABP.